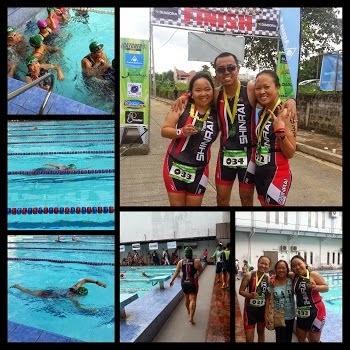 Together with my wife Irish and sister Haidee, as Team Shinrai, we joined the leg 3 of the Splash ‘n Dash 2014 Aquathlon Series. It was a 3-leg event where the 1st leg was held last April 6 and the 2nd leg last August 10. I did not join the first two legs for one obvious reason - I couldn't swim then. Irish and Haidee's age groups started earlier than mine so I was able to cheer for them as they try to conquer their first aquathlons too! 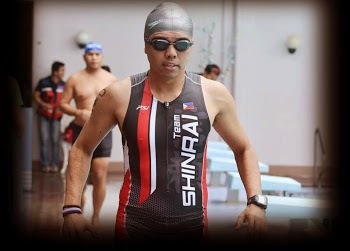 The event was about three weeks after my first triathlon so the memory was still fresh and that experience really helped me especially in the swim leg. 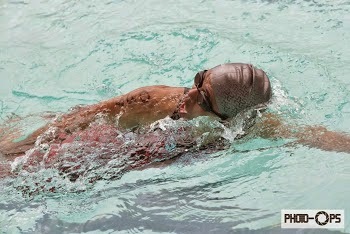 I didn't improve much on my swim speed and endurance but I was a little bit more confident in the pool. I finished the 800m swim in 35 minutes and 58 seconds. I headed to the transition area right beside the pool, put on my running gears then on to the road for the run leg. The weather was really good with a bit of the usual December coldness and the clouds were present. I pushed myself for the 10km-run but the best I could was a 33-minute 3-second finish time. I completed the race with my teammates waiting and cheering for me at the finish line in 1 hour 9 minutes and 1 second for 63rd place out of 87. It was indeed another great experience and a great event too. Kudos to the organizers and sponsors. Thank you Lord for allowing us to appreciate and celebrate one of your many blessings.